1. If you found the article in a library database, there may be some indicators of whether the article is "scholarly". Most publications in "Academic Journals" have been peer reviewed. 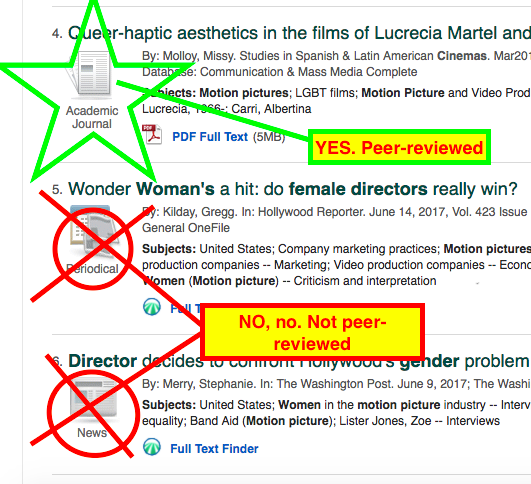 The corresponding icon next to the resource in the search results tells you what kind of source it is, including whether or not it comes from a peer-reviewed publication. Note, however, that some articles in peer-reviewed journals may not actually be peer-reviewed: editorials, news items, and book reviews do not necessarily go through the same review process. A peer-reviewed article should be longer than just a couple of pages and should include a bibliography. 2. In many library databases, the journal title may be linked, as shown below. Clicking on it takes you to a page that may indicate whether the journal is scholarly, academic, peer-reviewed, or refereed. 3. The publisher's website for the journal should also indicate whether articles go through a peer review process. Find a page like "For Authors" to locate this information. BE CAREFUL. Do your best not to rely only on the publisher's website in case it is misrepresenting itself in order to gain money, either from authors or subscribers. If it is vague or unclear whether or not a journal is peer-reviewed, it probably isn't. << Previous: How do I find Peer-Reviewed Sources?